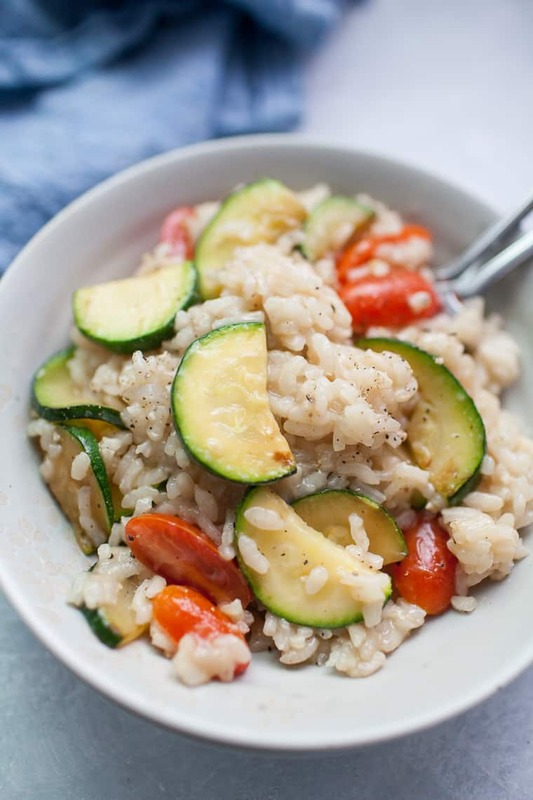 This homemade risotto base is the only risotto recipe you’ll ever need! Learn how to make risotto with the exact steps you need to make perfect risotto every time. This is the perfect Italian dinner! Risotto is the perfect way to level up your evenings! With just a little patience and a little time, you’ll have perfectly cooked risotto packed with flavor. 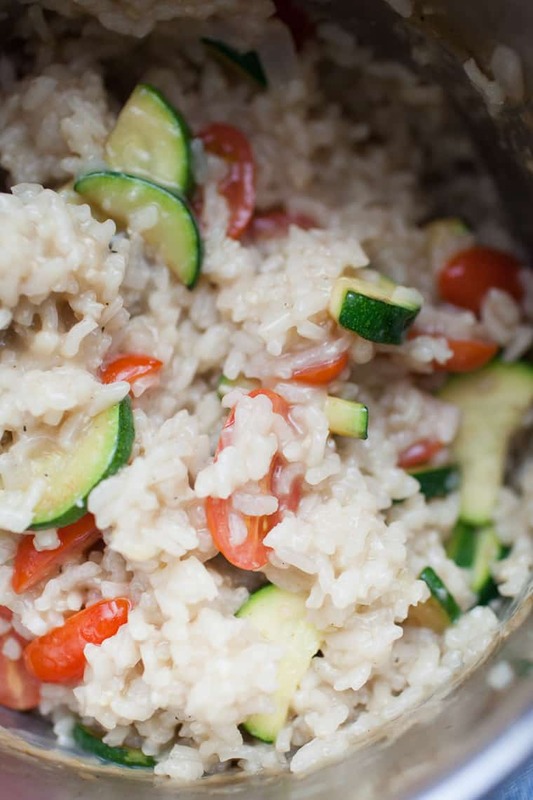 If you need an easy risotto recipe, this is it! It has all of the steps you need to feel confident trying this Italian dinner recipe. Mastering homemade risotto was one of the first recipes that gave me a huge boost of confidence in cooking. If you’ve ever watched a cooking show, they make it seem like risotto is overly complicated and like a delicate flower that you could easily mess up. 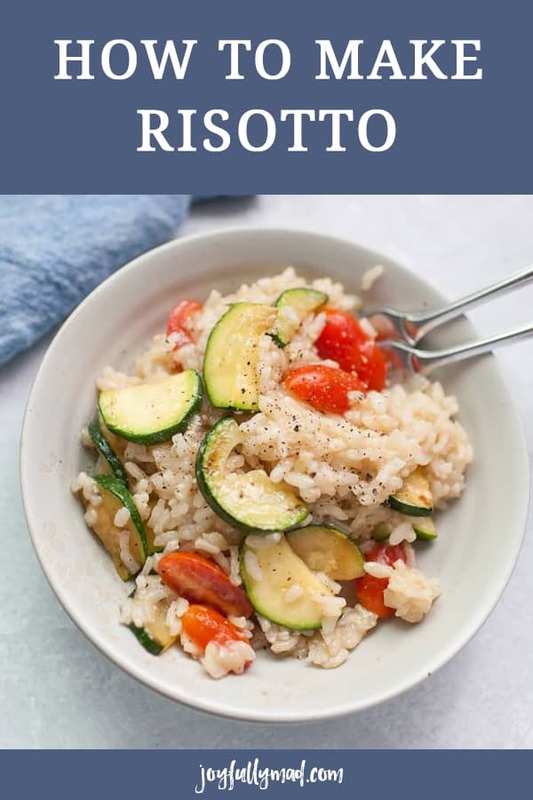 I find that risotto isn’t nearly as complicated as it seems to be, but the directions and time it takes to make it can often be a little overwhelming. I like to pair risotto with a simple protein like Pan Seared Chicken Thighs for a complete meal that I’m able to make all at once. Risotto does take time and it’s a process you really don’t want to rush. 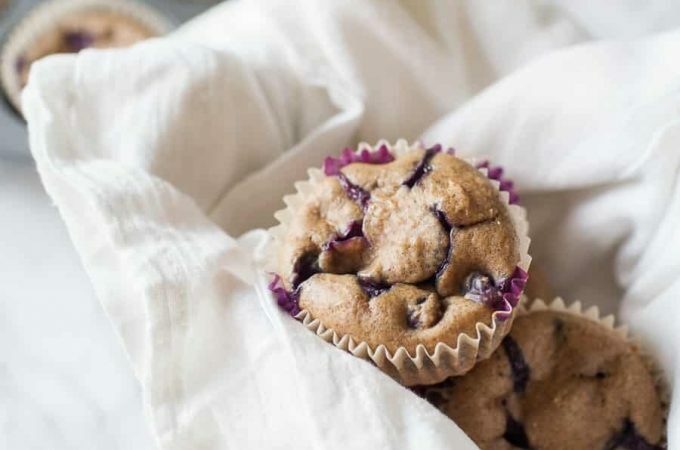 So be prepared to make this recipe on an evening where you have time (probably not after a long day at work or when your kids have had one of those days). Getting the base of this recipe is really the key here. Once you have this basic risotto down, the toppings have infinite possibilities. 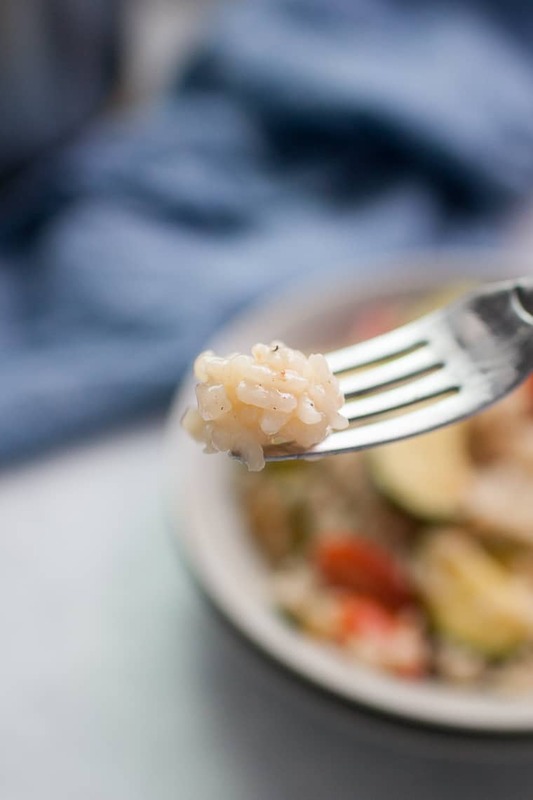 Unlike pasta, there are a lot of variables when it comes to cooking risotto, from how hot your broth is, what brand of rice you use, and how often you stir the rice. But don’t worry, none of these things will RUIN a risotto recipe, they may just change the cooking time and the final consistency. arborio rice. Risotto is made by slowly adding warmed broth into the rice allowing it to absorb the broth as you go. Adding the liquid slowly allows the rice to “bump together” which makes risotto creamy naturally without needing to add in any cream. 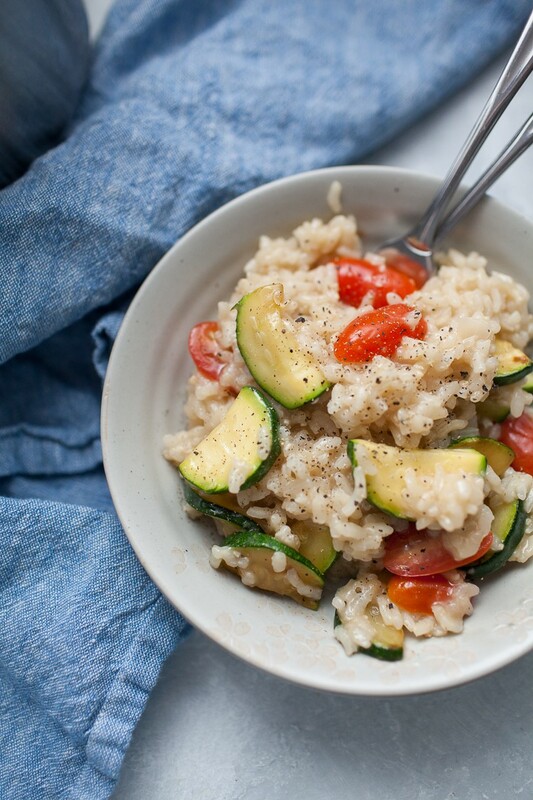 Many recipes call for added cream or cheese for extra creaminess, but risotto can be kept dairy free very easily. 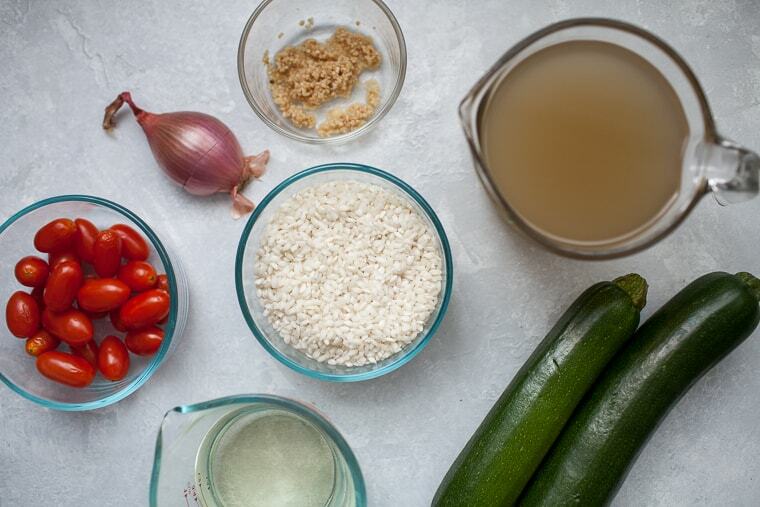 What ingredients do you need to make risotto? What tools do you need for risotto? In a small sauce pan, pour in broth and set to low heat. Cut off ends of zucchini and then quarter and slice about 1/2 inch thick. Set aside to cook in step 8. Slice grape tomatoes in half vertically and set aside, these will be tossed into the warm risotto after cooking. Dice onion and mince garlic. Add 2 tablespoons olive oil to a sauce pan on medium heat, sauté onions and garlic until almost translucent, about 2 minutes. Add arborio rice to pan and stir with wooden spoon until the edges are translucent, another 2 minutes. Pour in wine and let the wine absorb almost fully, about 5 minutes, stirring halfway through. Use a ladle to pour about 1/2 cup of broth into the risotto. Allow risotto to almost fully absorb broth before adding another ladle. Stir risotto occasionally, between ladling in broth. 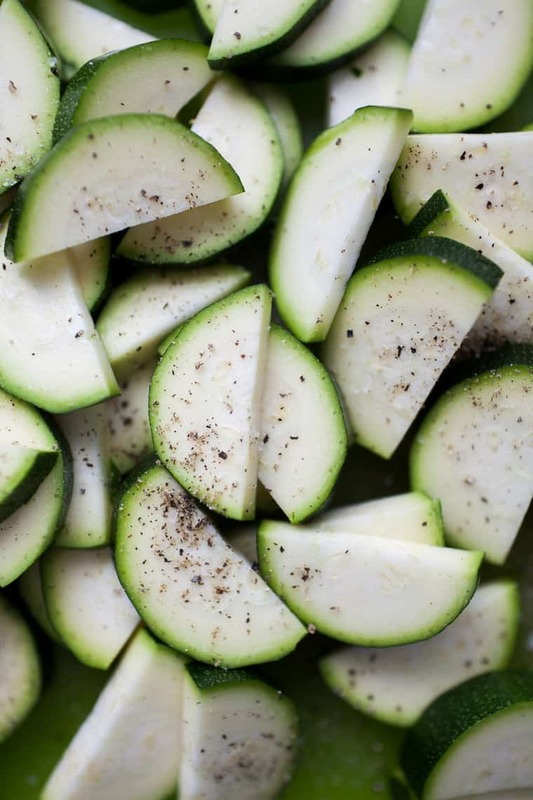 While the risotto is cooking, sauté zucchini in frying pan in 2 tablespoons of olive oil until zucchini is fork tender. When there is about a 1/2 cup of broth left to add to the risotto, take a spoonful to test. Risotto typically is served “al dente” but you can cook it to your personal preference. When resting, the risotto will continue to cook so be sure to not overcook it during this process. If needed, add the rest of the broth or more to cook to the right consistency for your preference. 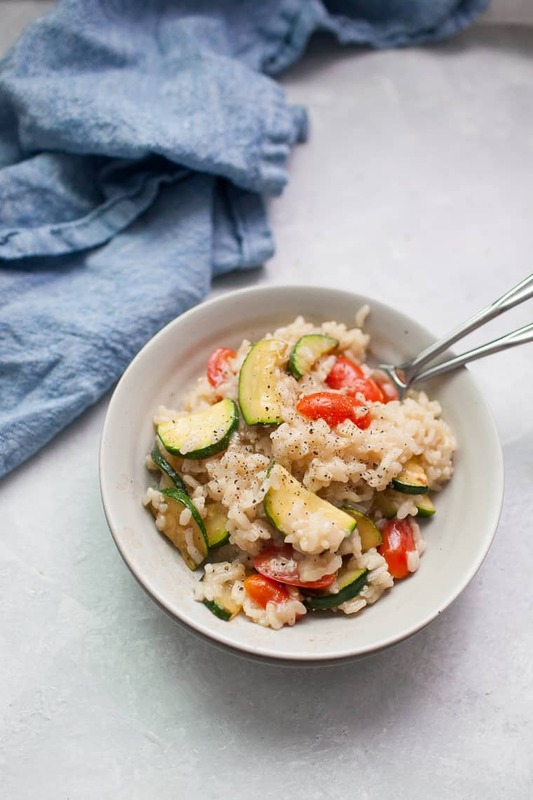 Add zucchini and tomatoes into risotto and stir together. Serve immediately. When you’re making risotto, you don’t want to be trying to time things to cook at the same time in the main pot. Cook any vegetables or proteins separately from the risotto and gently toss them in as the risotto is finished cooking. Pan seared chicken thighs or peach balsamic chicken would be perfect along side of risotto. You could also sauté some shrimp in butter or serve cast iron steaks alongside this risotto. I like to use a medium sauce pan to cook my chicken first and then add in the quartered zucchini right at the end just to cook slightly. Once everything has cooked separately, you can toss it all together gently. Top with any shredded cheese you want to use. Always use WARM stock, not cold. 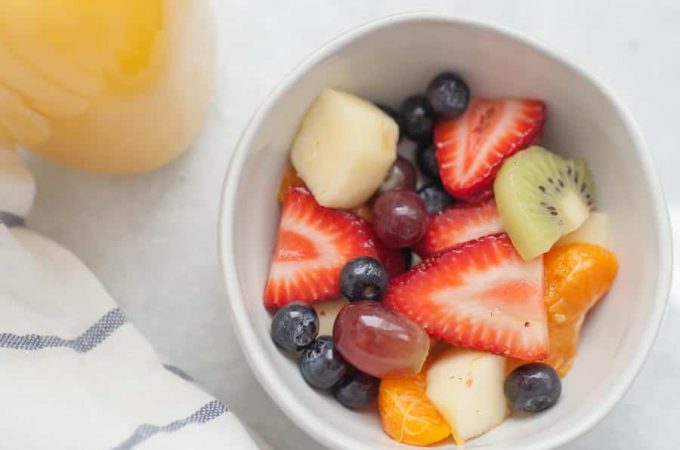 If your stock is a new container and is at room temperature, that is okay. But the best way to make risotto is to warm your stock in a small saucepan and ladle it into the risotto as it cooks. This can also help cook the risotto faster because it will keep the entire pot warm instead of shocking it with cold liquid over and over again. Stir your risotto occasionally. Stirring it too frequently will make it too sticky, but not stirring it at all won’t allow the starches of the rice to come in contact with each other, making the risotto naturally creamy. What kind of rice should you use for risotto? Arborio rice is going to be the easiest rice to find and use for risotto. 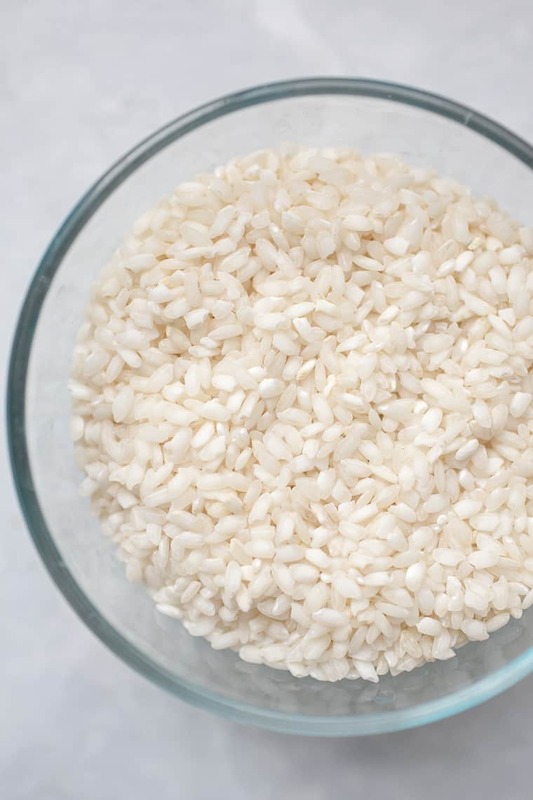 You do not want to rinse the rice before as it has starches on it that are essential to the cooking process to make risotto creamy! 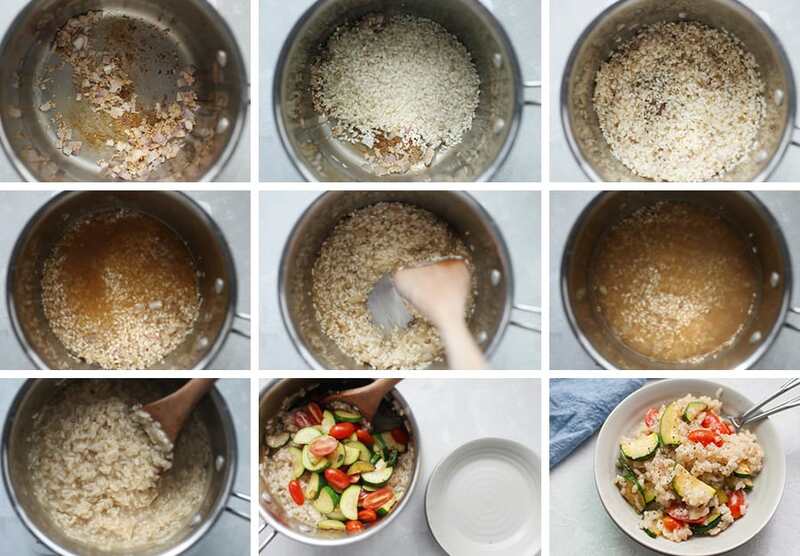 If you don’t have arborio rice, you can use another short or medium grain rice in a pinch. Avoid jasmine or basmati rice because they are not going to have enough starch to make risotto creamy. How do you know when risotto is done? Risotto is typically served a bit more cooked than “al dente”. If you take a bite of the risotto, it shouldn’t be crunchy but should also not be mushy. Find whatever that sweet spot is for your preference. But this definitely means that once you have used up all of the broth, be sure to taste test to catch it before it gets overcooked. Risotto will be creamy and still have some liquid to it. It shouldn’t be dry and able to form into a ball. If you run your wooden spoon through the risotto, you should see the bottom of the pan and be able to watch the risotto slowly fall back into place. Can you cook risotto without wine? Yes, you can. White wine is usually added during the cooking process for risotto to add flavor and acidity. 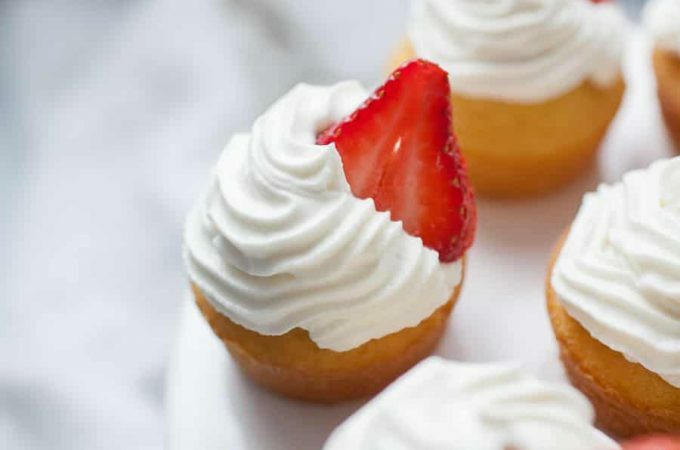 Skipping it won’t ruin the recipe, but you may want to squeeze in lemon juice at some point during the cooking process or at the very end for a punch of lemon flavor! Use a dry white wine or cooking white wine in your risotto, if you choose to use it. 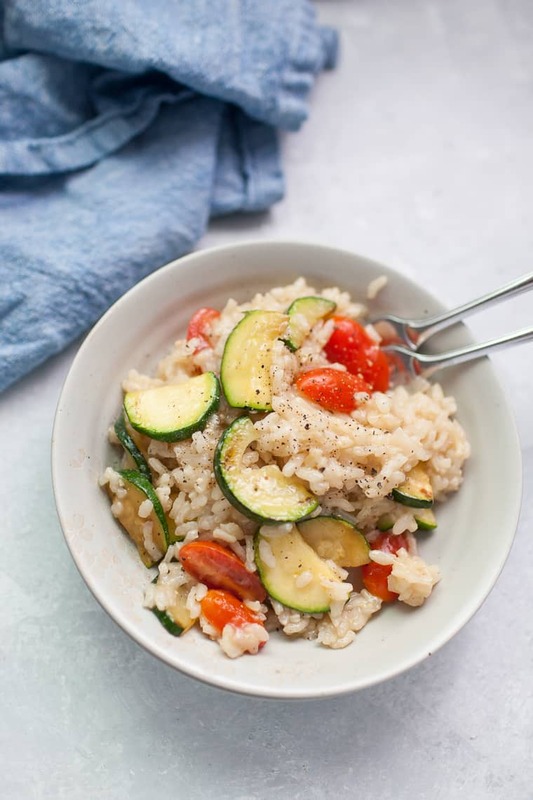 This homemade risotto base is the only risotto recipe you'll ever need! Learn How to Make Risotto with the exact steps you need to make perfect risotto every time. This is the perfect Italian dinner! When there is about a 1/2 cup of broth left to add to the risotto, take a spoonful to test. Risotto typically is served "al dente" but you can cook it to your personal preference. When resting, the risotto will continue to cook so be sure to not overcook it during this process. Always use at least luke warm stock - never cold. 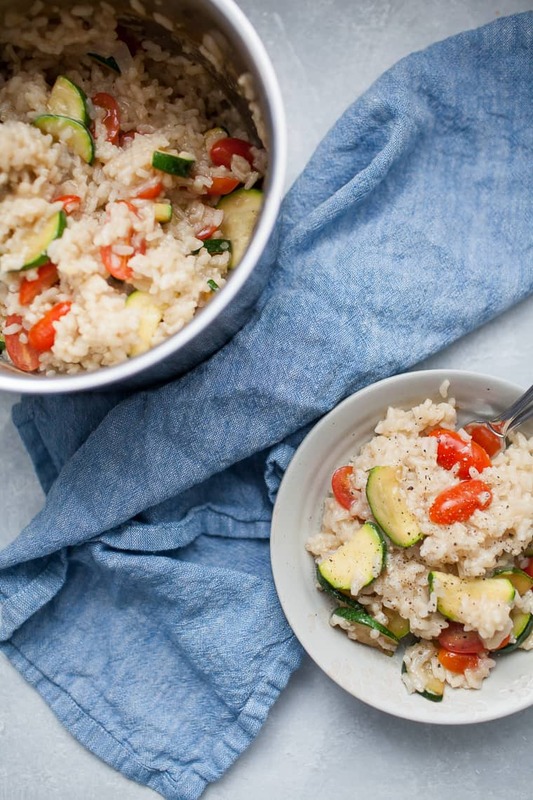 Use vegetable broth to make this risotto vegan. Instead of using wine, squeeze in lemon juice at some point during the cooking process or at the very end for a punch of lemon flavor. To reheat risotto, microwave individual portions or add a splash of cooking broth and bake until heated through. Risotto is something I’ve always wanted to try making! Thanks for making it so easy for me in this post. I love how you provided so much information and visual instructions. I can’t wait to try making this soon! I hope you enjoy it! 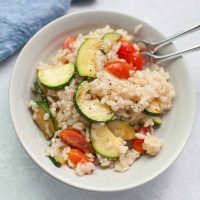 I wanted to try to make sure that this post makes risotto much easier to try! I made this for our Valentine’s Day dinner yesterday and it was delicious! It was my first attempt at risotto and your method was very easy and came out creamy with wonderful flavor. I skipped the zucchini and tomatoes, and roasted broccoli and butternut squash in the oven while the risotto cooked on the stove top. I mixed the squash in at the end and topped it with the broccoli. 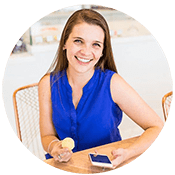 Thank you for the detailed instructions – this is my go-to recipe from now on! I am SO glad that you liked it so much. 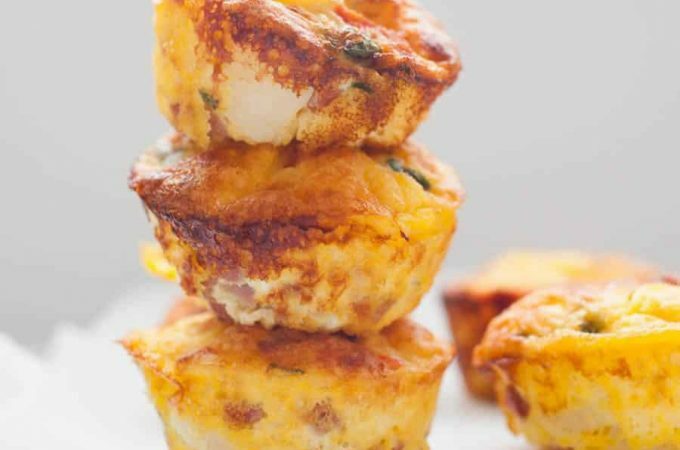 Your variation with butternut squash and broccoli sounds AMAZING!! I’ll have to try that next!